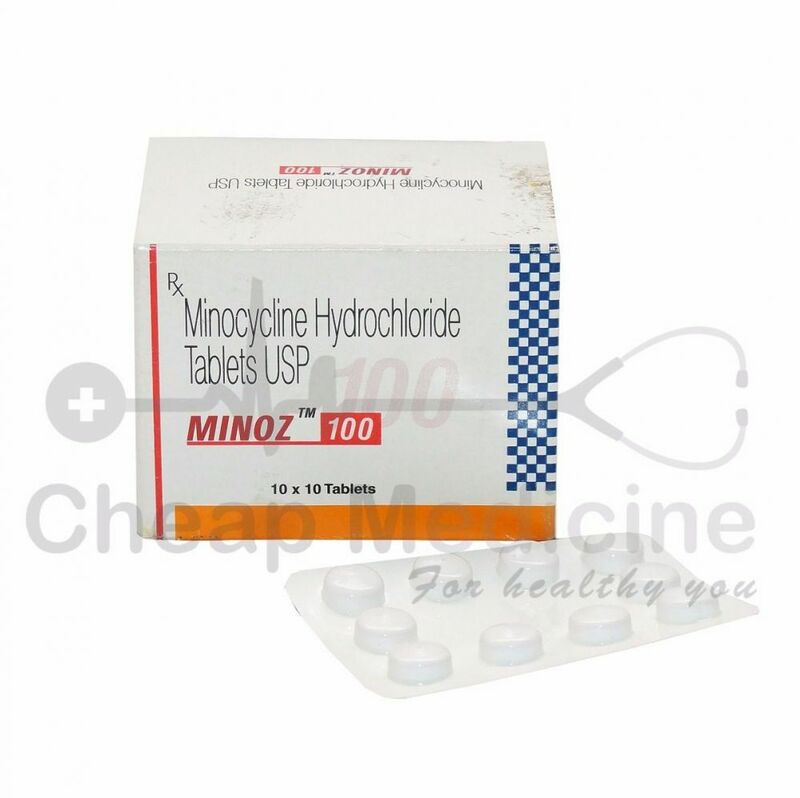 Minoz 100 is brand of Sun pharmaceuticals having salt Minocycline Hydrochloride. It is manufactured by Rexcin Pharmaceuticals and marketed by Sun Pharmaceuticals in India. The drug Minoz 100 is Tetracycline based antibiotic used to treat bacterial infections in skin like acne, respiratory tract and in some cases urinary tract infections as well. It is highly lipid soluble antibi.ic because of which it can penetrate prostrate and brain easily. It is a bacteriostatic antibiotic drug. Minoz 100 is manufactured by Rexcin Pharmaceuticals in India. Minocin is the US brand equivalent to Minoz 100 available in US markets. Uses of Minocycline Hydrochloride, the salt in Minoz 100. Minocycline hydrochloride is broad spectrum tetracycline based antibiotic. It is used for a wide range of bacterial infections such as of respiratory tract, skin like acne, and in some cases urinary tract infections as well. Minoz 100 having salt Minocycline Hydrochloride works by interfering with protein synthesis in bacteria. It blocks the growth of bacteria by non-production of proteins required for bacterial growth. Thus, bacteria can neither grow and nor spread in the body. Take the drug with a full glass of water, as directed by your doctor. It can be taken with or without food. Minoz 100 is a tetracycline based antibiotic. Thus, the dose depends upon the conditions of patients and varies from patient to patient. However, correct dose depends upon a doctor’s prescription. Take it as long as directed by your physician. Continuity of medicine depends upon your doctor’s advice. Dose of Minoz 100 missed? Take the drug immediately as soon as you remember. Do not overdose yourself, take the next dose and skip the dose if dose for next time period is near. More than 300 drug interactions have been noted or known with use of Minocycline hydrochloride. It may interact with aspirin, amphetamine, esomeprazole, fluoxetine etc. Side effects associated with use of minocycline include upset stomach, diarrhea, dizziness, unsteadiness, drowsiness, mouth sores, headache and vomiting. It increases sensitivity to sunlight. and might affect the quality of sleep causing sleep disorders. Prolonged usage or overdose may result in skin complications such as skin discoloration, muscle, and joint pain.